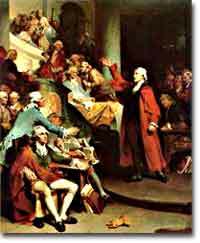 Patrick Henry delivers his famous "If this be treason, make the most of it!" speech to the Virginia House of Burgesses. On August 31, 1787, George Mason declared he would "rather chop off my right hand than put it to the Constitution as it now stands." To Antifederalists the proposed Constitution threatened to lead the United States down an all-too-familiar road of political corruption. All three branches of the new central government threatened Antifederalists' traditional belief in the importance of restraining government power. The preamble of the United States Constitution: Most of the world's democracies have based their constitutions on this document. A rather thorough biography of George Mason, one of the antifederalist leaders during the Constitutional Convention. He lobbied strongly for the creation of a separate "Bill of Rights." See a 3-D portrait of George Mason! The Admissions Dept. of George Mason University site has a quick biography of Mason, along with a Quicktime VR (you'll need to download Quicktime if you don't have it) of George Mason. Take a look at George Mason's home. One of the biggest problems the Antifederalist had with the Federalist plans was presidential veto power. They worried this would destroy the power of the legislative branch, which was directly elected by the people (unlike the president.) Check out the House of Representative's official site on how veto power works, and how much each president used his powers. This is a PDF file. Some consider the Virginia Constitution the model for the Bill of Rights and was the model for many other states' constitutions. Read it for yourself and decide. The Antifederalist wanted to avoid modeling the American Constitution after the British one. So, what was the big deal? Check out the unwritten tenets of the British Constitution and compare them to the system set up by the Founding Fathers. 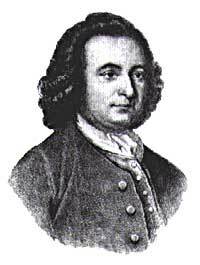 George Mason wrote one of the most important documents in American political history, the Virginia Declaration of Rights. Jefferson drew from it for the Declaration of Independence, and it became the basis for the Bill of Rights.